Make a design statement with this contemporary presentation of gerberas -- perfect for sending to someone with definite flair! Each flower speaks volumes about you the sender. 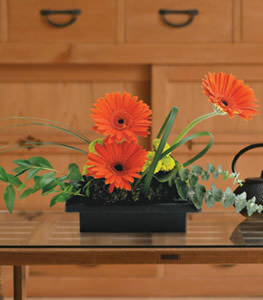 Vibrant gerbera are arranged with foliages and mosses. Delivered in a simple rectangular design bowl.